This year there were five couples who came over from France for the weekend just before the bank holiday in August. It was a busy weekend but much enjoyed by all the participants. 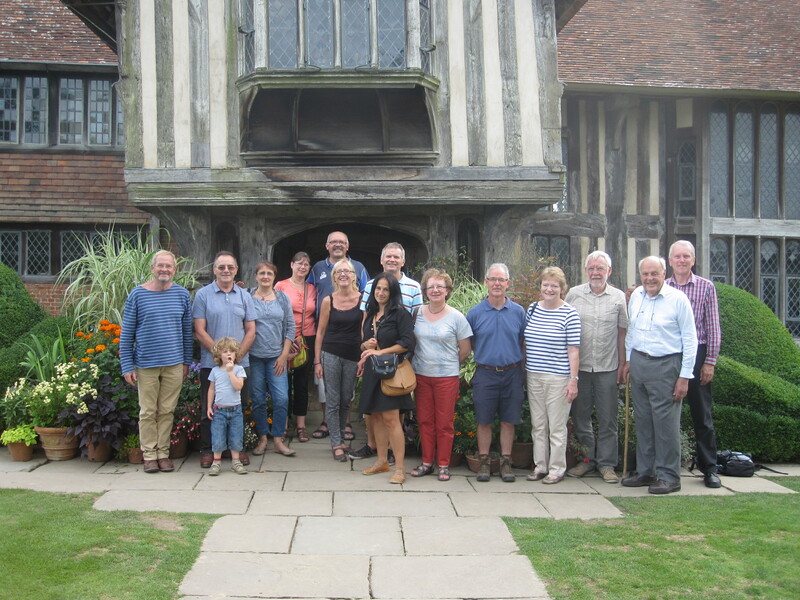 On the Friday Maggie Whittaker had organised a visit of the gardens at Great Dixter. We were given a superb tour of the gardens by one of the gardeners and this was enjoyed by many of the French participants. We also briefly went down into the meadow area to look at the one beehive that is kept at Great Dixter. After that several of us went to Hastings and fish and chips were bought for the French party. I am not sure that this was the best culinary experience they have had but, because of it, I don't think they will ever forget their brief visit to Hastings. On Saturday there was a visit to LASI at Sussex University. The research done at Sussex University proved to be extremely interesting to Christophe and it led to much discussion about the late summer treatment of honeybee colonies. We discovered how they tried to breed hygienic queen bees at Sussex. We stopped in Buxted for lunch in the garden of Chris Blandford. Glorious weather and a beautiful landscaped garden with a lake. Later on that afternoon we were given a wonderful welcome at Iwood Place by Jonathan Coote. Jonathan speaks good French and we found out about his 123 method of swarm control. We also had the opportunity to look at one of his hives and talk about his use of lactic acid to keep his bees clear of varroa. Shirley gave us a wonderful tea and the whole experience was enjoyed by everybody. On Sunday I had left time for hosts to look at their bees with their French guests. Heavy rain meant that the lunch we were going to have at the trout farm in Rotherfield had to be transferred to my house in Crowborough. A big thank you to all the hosts who cooked and provided salads, desserts,sauces and all sorts of goodies. I think all the French had a cracking time. Posted in News on 31/08/2015 by Peter Coxon.